one of the blogs in my google reader is Twice Remembered and today she had a fantastic post about edible 'potpourri.' I have been simmering apple cider with cinnamon sticks since the first hint of autumn so this was instantly appealing. I happened to have 3 apples sitting in a bowl waiting to be eaten, and 5 hours until my husband would be home, so I went to work. It really is just that easy...slice some apples, add good smelling things like vanilla, cinnamon, nutmeg and cloves, thrown in some brown sugar and butter, cover with water and turn on the heat! I tried to let it simmer as long as possible before burning my tongue to try an apple. pure joy in my mouth. the butter and sugar soak right in as the water evaporates and the spices are infused into the apple. unbelievable. brandon and i shared a bowl of wonderful dessert (or our daily serving of fruit!!) and then i poured the liquid left in the pot into a jar to use on ice cream later. tomorrow i'm going to buy about 20 pounds of apples and we'll have this every day until Thanksgiving!! Come on over, inhale the goodness and taste the wonder! freecycle is a wonderful thing. for those of you who don't know, it's like craigslist. people have things they don't want anymore, but the beauty of freecycle is...everything is free! the whole point is to keep things out of landfills so people are recycling by giving things away..hence free-cycle! a lot of the stuff people post is pretty useless, like they've cleaned out their junk drawer and feel guilty throwing away one rubber glove or their kids' half used coloring book, but occasionally we get something awesome! recent big ticket items include: maddie's kennel, a poker table top, some skis (she said they were cross-country, ended up being downhill...we'll probably give them away), a giant bag of vintage embroidery supplies, quilting magazines, knitting patterns and my current favorite: 3 kitchen chairs! 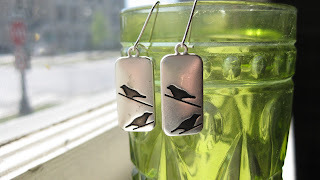 i just made these new earrings...well they've been a process over the last month. i love them, but i also want to sell them. do i keep them for myself or sell them? or make more and keep these for myself? they were a lot of work so i don't know that i want to part with them, but i don't know that i want to do the work all over again anytime soon. thoughts? in the past few months i have had numerous people tell me i should sell the jewelry i make. that sounds pretty simple doesn't it? turns out it's not! i decided a few weeks ago to set up an etsy shop and so the process began. first i had to choose a good name, then set up shop policies, choose shipping and prices, and that was all before I even added any jewelry to the shop!